While I’m on the topic of food, my culinary wizardry (I mean that in a totally non egotistical way) is really taking off. I love food. I love to eat. I love to eat food cooked by people. But until now, I’ve never really been into cooking. It’s the start of a new era, and I’m rather excited. “Kesha’s food blog” flashed through my mind, followed by my face beaming up from the cover of my own cookbook. Then I realised no one else is excited as me that I’m cooking Beef Stroganoff for the first time tonight. And while this new found hobby is great, I’m still extremely amateur. Still, the last few weeks have been a gourmand’s dream. I’ve tried my hand at prawn korma; pumpkin, basil and feta risotto; Moroccan chicken (with apricots, olives and almonds). There have been entrees of balsamic roasted beetroot, cauliflower puree and fried potato cakes. Even sweets have caught my fancy with lavishing’s of banoffee cheese cake, rhubarb crumble, and smoothies almost every colour of the rainbow. From veggie stir fry 7 nights of the week to gourmet chef? The cynics among you may wonder what could spark such a sudden change. I give you two words: love and competition. First there’s the love of my new flat mates. They’re such lovely men and new found friends. My inner house wife has finally emerged (better late than never) in an attempt to win their hearts through their bellies. They are also the perfect guinea pigs. They taste, they assist and they critique. 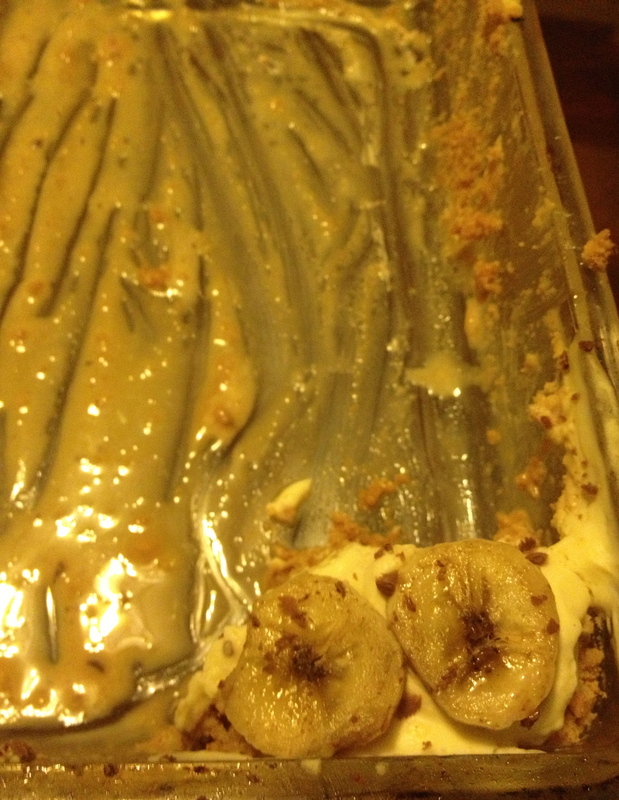 And four hungry men to feed ensure that I’m not the one finishing the entire banoffee pie in a fit of despair. I should also mention I’m ever so slightly competitive. With my flat mates presenting delicious 2 course meals every night I can’t be showed up by a bunch of guys. And so my competitive streak inspires cuisine creativity. I love it! It’s creative: I delight in the different flavours, colours and textures. Despite the stereotype, I’m happiest at the end of a long day of work with a chopping board, new recipe and fresh herbs in hand. And I’m amazed at the culinary goddess that’s been hidden all this time. I hate to get on the positivity band wagon, but I urge you all to find your inner culinary wizard. Then let’s all hold hands and sing Kumbaya over a roast chicken with lemon stuffed up its bum.